Londoners throng the Thames for today’s River Pagaent honoring Queen Elizabeth’s Diamond Jubilee. (Of course, there is rain.) 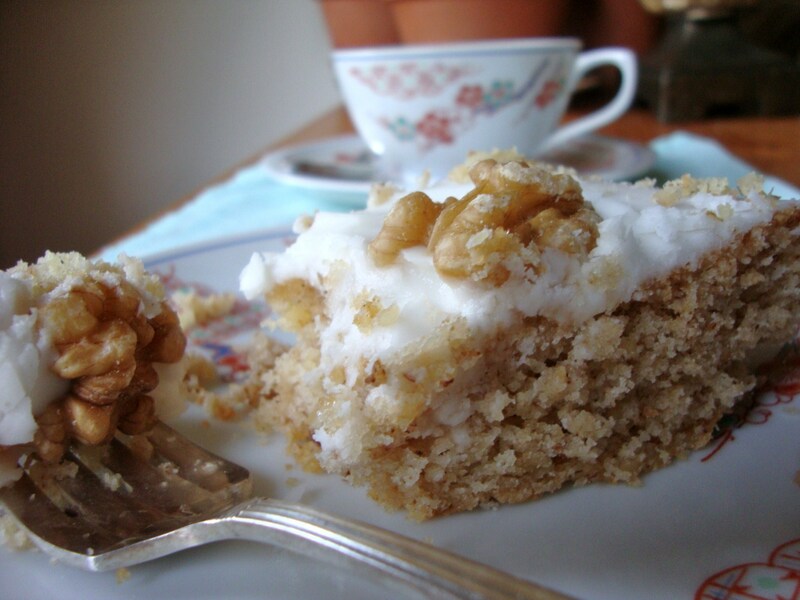 We’ll raise a cup to Liz II at tea with some Fuller’s Old-Fashioned Walnut Cake, after an afternoon outing to the National Theatre of London’s HD broadcast of Frankenstein! with Benedict Cumberbatch (Sherlock in the marvelously modernized version that just wrapped up season two on Masterpierce Mystery) as the monster. But enough plugs for British theater and television series starring actors with odd British names. Back to the Fuller’s Walnut Cake. Brits seem to have an overwhelming nostalgia for this simple, delicious sweet. It’s been a favorite on Three Points Kitchen since we discovered it for the wedding of Kate and Wills. Visit the Three Cubed entry for more on its origins.